One volunteer recorded data, one volunteer measured the diameter of the tree and one volunteered carried all the Tree ID books. Photo by Kristie Lalire. 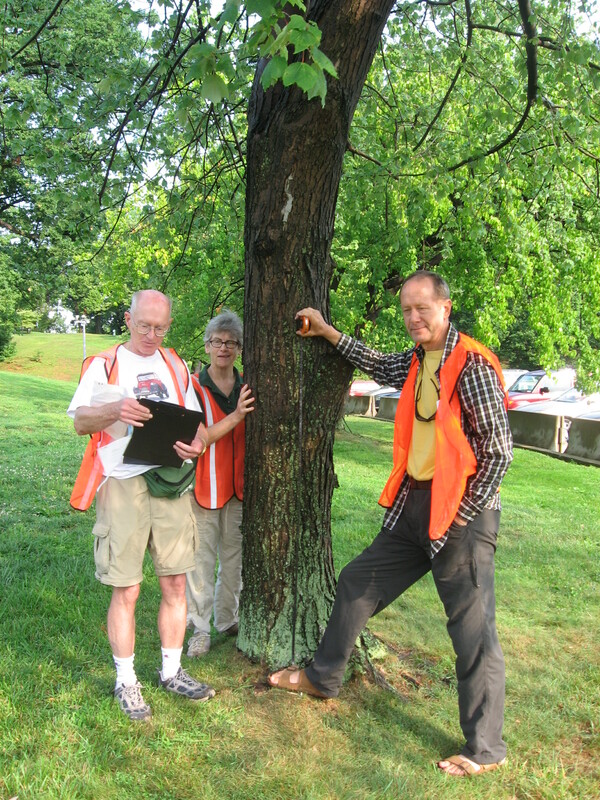 Unlike sheep, trees are counted during the day — very early in the Ft. Myer tree census project. 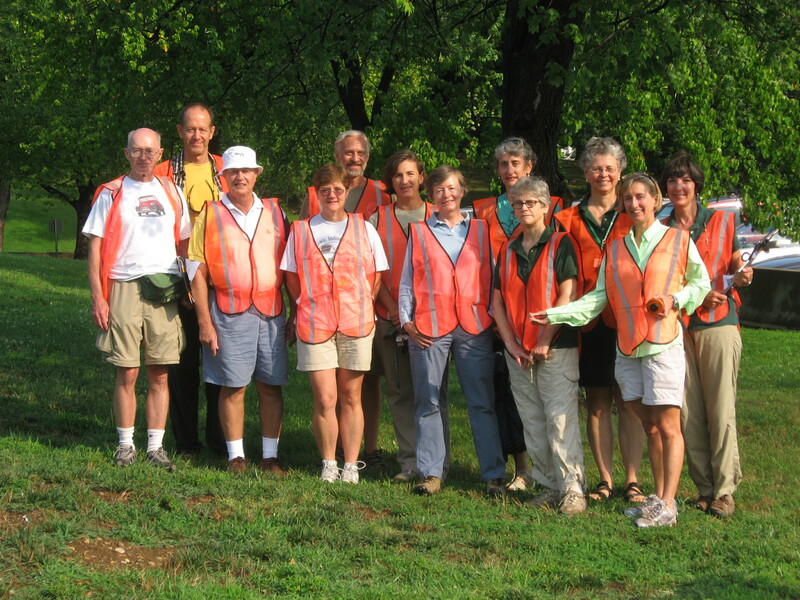 This summer, Tree Stewards, Master Naturalists, and Master Gardener volunteers cleared the security gates and reported for early morning duty to document the state of trees along streets, beside buildings, in residential yards and along the meadows. The statistics are impressive: 42 volunteers spent 460 hours identifying and assessing over 3800 trees on the military grounds. The project was conducted with military efficiency. TreeSteward Steve Campbell worked with the base coordinator Kristie Lalire and scheduled the early morning work sessions so that each segment of the base was systematically walked and every tree marked on a large satellite map. Volunteers were divided into groups of three and assigned a map quadrangle. Wearing orange safety vests, and equipped with maps, recording forms, tape measures and numerous tree identification books, they examined every tree in their assigned areas. Each tree was measured at breast height for its diameter (Special tapes were purchased for us by Arlington Extension Office), its species was recorded, and the health was assessed as Good, Fair, Poor, and Dead. Lively conversations occurred among the three team members about whether the classification should be Fair or Poor, and sometimes over whether the tree was an arborvitae, yew or similar cultivar. Why was this project happening? Well, if you asked one of the volunteers they might answer “Because its fun!”, “You get to spend time with like minded friends and talk trees.”, “You learn so much from other team members about tree health”, and “I’m finally learning how to tell oaks apart!” Conducting tree censuses is a wonderful volunteer activity for all these reasons. From the trees’ perspective, this census had immediate impact on their health. While the trees were being measured and assessed, team members often moved piled mulch away from the stem, loosened constricting wire, and noted other concerns. Now the information will be entered into a database and maintenance scheduled. Already all of the “Poor” trees have been referred for evaluation. Knowing what you have that is in jeopardy is essential to its protection. Alexandria is our next project for a tree census. City Arborist John Noelle trained a core of TreeStewards last week and provided maps and forms. He’s excited that the census will assist in setting up a maintenance plan with ongoing tree assessment. It’s too late in the season for easy canopy assessment and species identification, but we are ready for next spring! We’ll let you know when the project starts in March. This entry was posted in Community Service and tagged assesment, census. Bookmark the permalink.